Online slot Queen of Hearts made by reputable company Novomatic takes the player back to the Middle Ages, when every pious knight dreamt to win the Queen`s heart. Everyone wanted to please the queen and at least make her smile. Now you have a chance! You can play Queen of Hearts for free or for money and try this romantic slot with a lot of tournaments, battles with dragons and court intrigues. 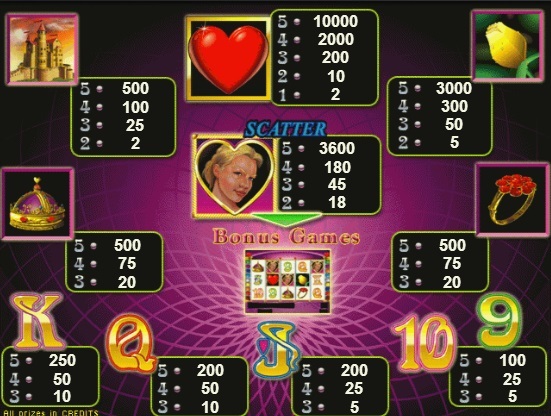 Modern gaming slot Queen of Hearts has a full set of bonus symbols. First of all it’s the Heart, which is a wild symbol in this game. It substitutes for any other symbol and will multiply amount of a winning combination which at first seemed as not paying. Symbol of the main character Queen of Heart is a scatter. It guarantees you the chance to play bonus game. Depending on how many scatters are there on the reels, player gets 8, 15 or 20 free spins. Besides, all the winnings will be tripled! Different slot machines have a pleasant design, but only Queen of Hearts is in pink, purple and scarlet colors. And all because this video slot is aimed at love and romance. It is extremely interesting and exciting. Nice and relaxing music, colorful animation, truly immersive storyline and intuitive interface - a few slots can boast of that! Do you enjoy spending time with fun and pleasure? Then Queen of Hearts slot online is for you!